ThunderCats Hooooooo!! One of my all time favorite cartoons when I was a youngster. This is the first time I've attempted to draw anything ThunderCats since my kiddie drawings I did so long ago, I'm pretty happy with this one. Great show,too bad the finale wasn't all that great. Thanks! A lot of the 80's action cartoon shows ended on a so-so note. Nice! 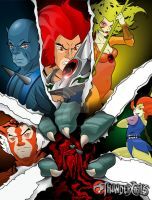 I loved the Thundercats cartoon growing up. Hey great piece! Love the colors, perspective and slime in Mumm-Ra's mouth! the back mumra its cool, something in the liono colour doesnt like. but its a great picture. Thanks. I think I have an idea why it might not work. I used different coloring techniques on each character. Mummra is colored in a more shaded 3D look, and Lion-O is done in flat colors layered on top of one another similar to the cartoon. That's just my thought I could be wrong. Haha, it's still cool . great job on this, and yeah, it did have one of teh better intros of the day . Thank you! Yeah, even though I loved the show ,the intro animation made me wish the episodes looked that cool but they never did. Oh well, we'll see what happens with the upcoming movie. It had hands down one if the coolest show intros ever. If you don't remember You Tube it.... Good times! I was looking through all the new artwork here on DA and your artwork caught my eye...I think you did wonderful job on this piece! I love it! Keep up the amazing work!